In his rookie year, the Jazz guard Donovan Mitchell stirred some serious soup with the "Rookie?" campaign backed by Adidas. Race for 'Rookie of the Year' was neck-to-neck with Ben Simmons of the Philadelphia 76ers. The latter went on to win the honor but the 13th pick from 2017 draft has surprised the world with his phenomenal rise. The stats that Mitchell posted throughout the season and the contribution that he made for the Jazz team to secure the 5th position in the Western Conference and in the post-season, was commendable. Adidas is known for the support and promotion for their athletes. They and Mitchell had a three-year sneaker deal which is now converted to a new, multi-million-dollar endorsement contract with Mitchell's own signature shoe. Mitchell officially revealed his first signature shoe this week. The unveiling was done very unconventionally, in talk with two teen sports writers from Mitchell's alma mater- Greenwich Country Day School, Connecticut. The students were eighth-grader Blaise New, whose older brother played with Mitchell at GCDS, and ninth-grader Rory Ashmeade. Mitchell's debut sneaker is named the Adidas D.O.N. Issue #1 and is set to be released around 2019 playoffs. The initials D.O.N. stand for the the first three letters of his name and his mantra "Determination Over Negativity". The name is also inspired from comic-book-series naming "Issue" number strategy. The logo is derived from Mitchell's love for his superhero Spider-Man. 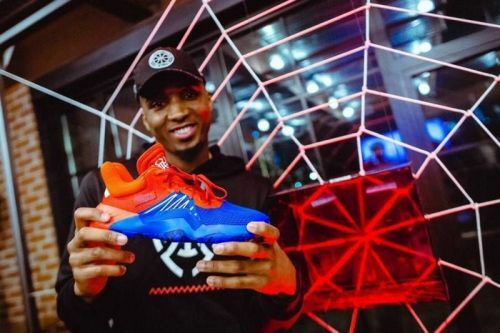 Mitchell is the first-ever player from the Utah Jazz to have his signature shoe and one among the eighteen superstars in the NBA to achieve this feat. The 22-year old is one of the youngest on the list to have this honor. The brand has three other active superstars with their signature shoes -- James Harden of the Houston Rockets, Damian Lillard from the Portland Trailblazers and Derrick Rose from the Minnesota Timberwolves. In the unveiling interview, Mitchell had some inspiring stuff to deliver and show his gratitude to what he has achieved so far. The kid, who is the closest in comparison to Dwayne "The Flash" Wade, is taking the NBA by storm. As he continues to do so and grow as a professional, Adidas is dedicated to be part of his journey. It will be interesting to see how the fans welcome D.O.N. Issue #1 and how the Adidas franchise goes ahead with the series.